Villa Papatyam is a traditional villa situated at the edge of forests in the beautiful village of islamlar. The villa accommodates five guests, including children. With its private pool, large terrace, outdoor bbq and stunning sea views over the hills towards kalkan, villa papatyam is your excellent choice for a relaxing holiday. The hills ensure a cooler and dryer climate than the one down at the sea shore: generally a marked difference of around 5 degrees c in summer.A holiday spent at villa papatyam allows you to combine the quiet surroundings of islamlar with the attractions of kalkan and its region, among others beautiful patara beach (a 20+ minute drive), kaputas beach (also a 20+ minute drive), and many archaeological sites such as xanthos and letoon. Kalkan town with its friendly pebble beach, abundant restaurants and attractive shops is only a 15 minute drive away from the villa. The villa is part of a compound with two other villas, but all enjoy their entire privacy. We are a Dutch family constantly on the move for our NGO and consultancy work. Villa Papatyam in Islamlar is our stable element. We purchased the villa in early 2010, and have ever since been extremely pleased with it. It offers a great holiday place to us whenever we want. The area offers a lovely, quiet holiday environment in a wonderful climate, but at the same time close to shops, restaurants and fantastic beaches. all you wish for your holidays at once! Peaceful rural setting very close to the bustle of beach town life. Total privacy of the villa and pool. Exceptional beauty of landscape. Notes on accommodation: A stay at Villa Papatyam guarantees a relaxing holiday in one of the most beautiful regions of Turkey. The village surroundings offer a break from the busy town life, and make you feel being part of nature. Electricity may be weak at times in summer, when the grid is being overloaded due to the extensive use of airconditioners. 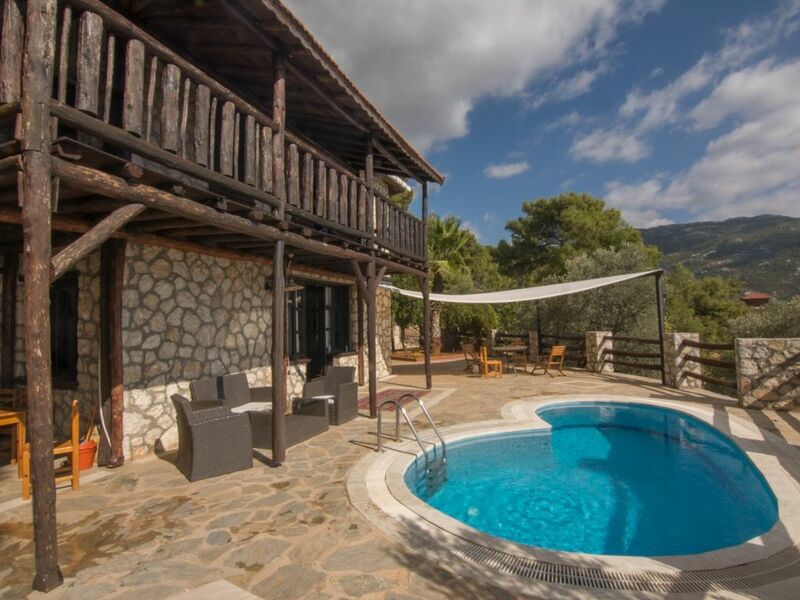 The villa has air conditioning in all rooms as well as in the wooden cottage. Hot and cold running water are available at all times. The hot water system runs on solar power, so as not to unduly overload the electricity system, and adhere to our philosophy of helping the environment. Outside: Large gardens with around 80 olive trees surround the villa and or to the exclusive use of the residents of the villa. the outdoor bbq on the terrace in front of the villa allows you to enjoy the superb sea view while cooking your own dinner from the excellent meat available in kalkan or the trout from islamlar village. the small pool in front of the villa is for your exclusive private use. It allows you to have a fresh dip to start of your (generally quite warm) summer day. Utility Room: iron, iron desk, for stays longer than one week laundry and cleaning service is included. Cleaning / Towels / Linen / Maid service: All linen (except beach towels) included. Laundry and cleaning service offers for stays over one week. Other: Small wooden cottage in the garden offers privacy to your friends and/or family who would like to join you on your holidays. We had the pleasure of staying at Villa Papatya for 10 nights in September. It was stunningly beautiful and had the most incredible views across to Kalkan Harbour. It is traditional style which we absolutely love and had everything to make you feel totally at home, including a inourmous main bedroom! We had the best nights sleep that we had had in years! The location just outside the village of Islamlar is perfect as it is so peaceful and yet only 10 mins walk (would need a torch as dark roads) to a few very good local restaurants (or 2 minutes drive) and also only 20 mins drive down the mountain to the bigger but beautiful harbour town of Kalkan, which hosts lots of bars, restaurants, supermarkets and ATMs. It is close to many historic sites and the bigger holiday towns such as Olu Deniz are only a 50 minute drive away. Loads to do but great to return to the villa for a cooling dip at the end of your busy day. The temperature in the hills is about 5 degrees cooler than on the coast which is a great releif. We had a small issue with the hot water, but i made one phone call and it was fixed within the hour. You can't ask for better service than that - the maintenance company were great. Heleen (the owner) was also great to deal with and kept us informed at every step of the booking process. Overall the most relaxing holiday we have had for ages and one that we will definitiely repeating. Thank you Heleen your villa is perfect. Das Haus liegt in hervorragender Lage: Die Aussicht aus den Bergen auf das Meer ist wunderbar, im zugehörigen Pool kann man sich jederzeit erfrischen. Mit dem Auto fahrt man ungefaehr eine halbe Stunde bis zum Strand nach Patara. Die Häuser der Anlage sind so von einander getrennt, dass keine Beeintraechtigung stattfindet. Der Service ist ausgezeichnet. Das Haus ist angenehm eingerichtet; es gibt einen Geschirrspueler und eine Waschmaschine. Thank you very much for your kind review. We were very happy hosting you in Villa Papatyam and would love to see you come back! La villa es muy bonita y tranquila. La piscina una gozada. La habitación muy grande con aire acondicionado. Muy amables nos dejaron agua, y todo lo necesario para desayunos, leche, café, te, mantequilla, etc. Volvería son dudarlo. Thank you very much for this great review. We are very pleased that you enjoyed Villa Papatyam and will be happy to have you back! Wir haben uns vom ersten Augenblick wohl gefühlt. Die Villa ist geräumig und sehr geschmackvoll eingerichtet, Ausstattung & Geschirr war alles da. Sogar fürs leibliche Wohl wurde gesorgt: Brot, Milch, Wasser, Tee/Kaffee, Butter, Eier, Honig... alles da. War für uns ganz toll, da wir erst gegen Mitternacht angekommen sind und so alles fürs Frühstück hatten. Die Kinder haben den Pool geliebt. Auch die beiden Katzen (Mutter mit Katzenbaby) wurden freudig umsorgt. Wir haben sogar Landschildkröten im Garten entdeckt. Natur und Erholung pur. Die Villa liegt am Ende der kleinen Ferienanlage und man genießt völlige Ruhe und Privatsphäre. Auto ist unerlässlich und der Weg zur Villa steil, teilweise Schotterstraße. Kalkan/Kaputas Strand/Patara liegt alles in ca. 30min Autofahrt Reichweite. Pool- und Gartenservice kommt 2 x tgl früh morgens und abends, ist aber ganz unauffällig und leise. Wir haben uns sehr wohlgefühlt und es hat uns an nichts gefehlt! Kalkan's pebble beach (just 15 minutes by car) has been carefully and attractively extended. Patara Beach is just a 20+ minutes by car. The beach is regularly featured as one of the Mediterranean’s most beautiful beaches. The only building on its entire 18 kilometres of sand is a small café. The dramatic Kaputas beach is a ten-minute car ride from Kalkan. It is a beautiful beach found at the foot of a ravine down many, many steps! Dalaman is the nearest airport, at a distance of about 120 km, a drive that takes maximum two hours along Turkey's stunning turquoise coast. Can hire or the use of a car is essential to get from the airport to the villa. Kalkan is an enchanting historic town and one of the most beautiful along Turkey's Lycian Coast. With the absence of mass tourism, Kalkan remains a charming and unspoiled haven of lush nature, brilliant blue crystal-clear sea, historic architecture, ancient history and warm traditional Turkish hospitality. A small peaceful Mediterranean resort and fishing town nestled at the base of a mountain, the pretty town and its narrow streets lined with old whitewashed villas many of which are draped in vibrant bougainvillea, twist down to the harbour. The town overlooks a beautiful bay in which islands seem to magically float upon the shimmering sea.This once sleepy fishing village now has an air of sophistication about it with an abundance of chic boutiques, interesting shops, restaurants, bars and cafés. In fact, Kalkan is said to have the highest number of restaurants and bars per inhabitant or square meter on the Turkish coast (over 100 of them!). Relaxation is easily found in Kalkan. You can stretch out in the sun by the water's edge at the many beach clubs or enjoy the atmosphere of the town beach where the water is clear and turquoise. There are many water sport activities available and a sea rich in history and life for scuba divers to explore. If you are interested in Turkey's colourful history, Kalkan is perfectly located in the heart of the Lycian region with numerous ancient historical sites within easy access. Only a short distance away are the historical sites of Patara, Letoon, Pinara, Tlos and Xanthos, with Kekova, Demre, Myra, Phaselis, Olympos and Aspendos slightly further afield, but all easily accessible. Islamlar village is set in the Taurus mountains, a 15-minute drive from Kalkan but another world in terms of ambience. Islamlar is a wonderful base from which to enjoy the region. Islamlar offers guests outstanding opportunities to dine in one of the renowned village trout restaurants whilst admiring the views across the mountain range to Kalkan. Booking Notes: Please send us a booking enquiry to which we will respond within 24 hours. Bookings are confirmed once we have received 50% of the total fees due. Changeover Day: We have flexible change over dates to make your holiday as easy and pleasant for you as possible. Notes on prices: We charge an additional GBP 100 per week for use of the wooden cottage.